A dear friend gave me a tagine and tagine cookbook. 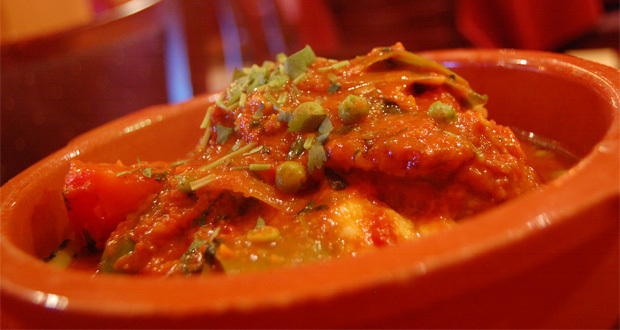 The tagine pot is a Berber dish from North Africa. It is formed entirely of a heavy clay, which is sometimes painted or glazed. It consists of two parts: a base unit that is flat and circular with low sides and a large cone- or dome-shaped cover that sits on the base during cooking. The cover is designed to promote the return of all condensation to the bottom. With the cover removed, the base can be taken to the table for serving. I found this super low carb recipe and super high protien tagine dish that just made my senses come alive! We used Tilapia but Cod or Catfish also work well. Although this is a recipe to be cooked in a tagine it can however, be cooked in a covered frying pan just as sucessfully. In the bottom of a flame proof tagine, heat oil over medium heat. Add onion and seasoning and cook stirring for 5 minutes. Add fish and peas to tagine and season with salt and pepper. Add water and lemon juice so that water is slightly more than halfway over fish. Bring to a gental simmer over medium-low heat. Cover, reduce heat to low and gently simmer turning fish once for 10 minutes or until fish is opaque and flakes easily with a fork. Transfer fish to a platter and keep warm. Add spinach to tagine and cook over medium heat for 2 to 3 minutes or until wilted and the liquid has evaporated. Drain excess liquid if the spinach is cooked before it is all evaporated. Stir in yogurt and return the fish to the sauce and heat through.